President Barack Obama spent a leisurely five hours golfing Sunday afternoon as his Martha’s Vineyard vacation continues while Iraq falls further into chaos. 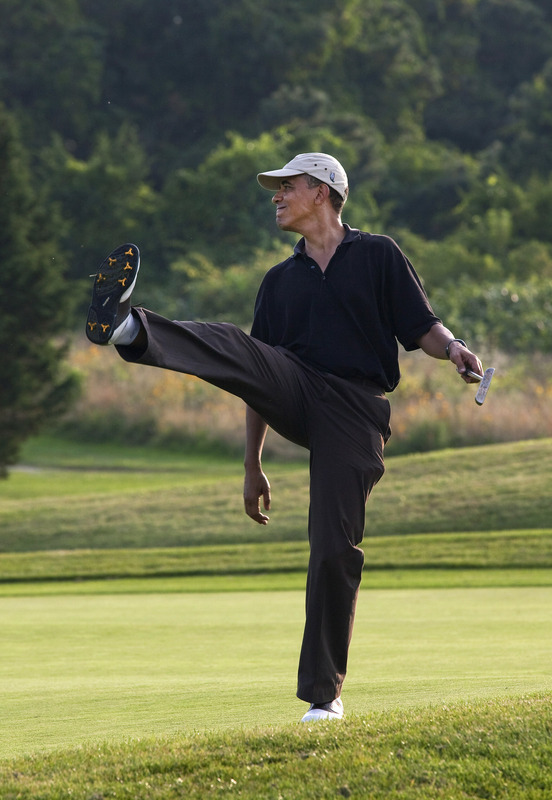 As Obama was midway through his golf outing reports from Baghdad erupted with rumors that Prime Minister Nouri al Maliki was staging a coup to hold on to power as Iraq struggles to form a new government while fighting off the ISIS terrorists’ conquest of large swaths of Iraq. Right before heading off for his annual two week vacation at Martha’s Vineyard, Obama ordered air strikes against ISIS to ward off a possible advance against Erbil in Kurdish controlled northern Iraq. The news out of Baghdad was preceded by an unheralded announcement that the Obama administration was evacuating some, but not all, U.S. personnel from Baghdad and Erbil. Rampant rumors of a coup by Maliki to remain as prime minister for a third term were based on reports of Iraqi military being suddenly deployed in key areas in Baghdad including the presidential palace and the Green Zone. The Wall Street Journal quoted an experienced Iraqi hand as saying this was not a coup–yet. The Journal reported troops were deployed in the Green Zone. Other reports had troops stationed in neighborhoods around the Green Zone. Brett McGurk, Deputy Assistant Secretary of State for Near Eastern Affairs (Iraq and Iran), tweeted Sunday evening U.S. support for Iraq’s new President Fuad Masum over Maliki. The Hill reported Sunday night that State Department Deputy Spokesperson Marie Harf repeated McGurk’s support for Masum in a statement that also said the U.S. was monitoring the situation in Iraq. “U.S. officials are “closely monitoring” developments in Iraq amid reports of a possible coup and are in touch with Iraqi leaders. “”The United States fully supports President Fuad Masum in his role as guarantor of the Iraqi Constitution,” State Department Deputy Spokesperson Marie Harf said in a statement.